Oded Yinon, whose 1982 paper for Kivunim (Directions) entitled “A Strategy for Israel in the 1980s”, is often used as a reference point for evidence of an Israeli aim to balkanise the surrounding Arab and Muslim world into ethnic and sectarian mini-states, was recently interviewed. He discussed the notoriety of the document which came to a wider audience a few years later after it was translated into English by Israel Shahak. But while Yinon down plays the specific application of his paper to actual geopolitical events, the ideas posited in his article have arguably formed an enduring central policy plank of the Zionist state; balkanisation having been a necessary condition first in creating the modern state of Israel, and thereafter as a means of ensuring its survival and maintaining its military dominance in the Middle East. The theme of balkanisation has always formed an essential part of the rationale of Political Zionism. The refusal by Sultan Abdul Hamid II of Theodor Herzl’s offer of £150 million (sterling) as a down payment towards the Ottoman national debt in exchange for a charter enabling Zionist settlement in Palestine meant that the early leaders of Zionism would in due course redirect their efforts in seeking a means of creating a Jewish homeland in the Middle East. A necessary precondition of this would be the dismantling of the Ottoman Empire, and a step towards favourably positioning Zionist aspirations in the event of the liquidation of that empire came with the agreement struck during the First World War between the Zionist movement and the British government. The Balfour Declaration and the implementation of the Sykes-Picot accord created the basis through which the goal of securing a future Jewish state within the territory designated as a British Mandate could be focused. After the establishment of Israel in 1948, a national policy of weakening Arab and Muslim states, balkanising them, or keeping them under a neo-colonial state of affairs has persisted. The prevailing logic was and always has been that any stable, nationalist government in the Arab world poses an existential threat to Israel. For instance, David Ben-Gurion, Israel’s first prime minister, was vehemently against President Charles de Gaulle’s decision to grant Algeria independence. Perhaps … now is the time to bring about the creation of a Christian state in our neighbourhood. Without our initiative and our vigorous aid this will not be done. It seems to me that this is the central duty, or at least one of the central duties, of our foreign policy … We must act in all possible ways to bring about radical change in Lebanon … The goal will not be reached without a restriction of Lebanon’s borders. Ben-Gurion had wanted Israel’s northern border to extend to the River Litani. This was made clear through the plans submitted to the Versailles Peace Conference in 1919 by the representatives of the Zionist movement. The water resources provided by the Litani, the River Jordan, and the Golan Heights were considered to be essential prerequisites for the sustenance of the inhabitants of a future Jewish state. According to Dayan the only thing that is necessary is to find an officer, be he just a major. We should either conquer his heart or buy him with money, to make him agree to declare himself the saviour of the Maronite population. Then, the Israeli army will enter Lebanon, will occupy the necessary territory and will create a Christian regime which will ally itself with Israel. The territory from the Litani southward will be totally annexed to Israel. Dayan’s hope for a surrogate militia would come to pass in the 1970s with the creation of the South Lebanon Army (SLA), which did the bidding of Israel in its battles with the Palestinian Liberation Organisation (PLO) and other sources of resistance to Israeli power. In 1979, the leader of the SLA, Major Saad Haddad, a renegade officer of the Lebanese Army and a true life incarnation of what Sharett referred to as the “puppet” desired by Dayan, would even proclaim an area controlled by his group as ‘Independent Free Lebanon’. While the SLA is now defunct, the leaders of Israel continue to covet parts of south Lebanon. It remains an important factor behind Israel’s goal of destroying Hezbollah, the Lebanese Shia militia which forced the withdrawal of the Israeli Defence Forces (IDF) from south Lebanon in 2000, and which repelled the IDF’s incursion into south Lebanon in 2006. It is important to note that the intellectual, if not moral, justification for the policy of balkanisation has come from many position papers produced by Israel-friendly (many would argue Israel-First) neoconservative think-tanks and other right-wing organisations, which have supported the idea of breaking up the Arab Muslim lands of the Middle East and North Africa. These include those disseminated by the Project for the New American Century (PNAC) and the Rand Corporation. A Clean Break: A New Strategy for Securing the Realm, a document prepared in 1996 by the Israeli-based Institute for Advanced Strategic and Political Studies, and presented to Binyamin Netanyahu during his first tenure as prime minister, called for Israel to “contain, destabilise, and roll back” a number of states including Syria and Iraq. Allied to the intellectual justification is the use of military force to practically effect such balkanisation. This has come through using the United States, over which the the Israel lobby has continually had a decisive influence, as either the main protagonist in military actions such as the invasion of Iraq, or as the overseer of covert operations geared towards destabilisation as has been the case in the Syrian conflict. In January 1998, members of PNAC wrote an open letter to President Bill Clinton urging him to remove “Saddam Hussein and his regime from power.” This forceful plea was followed by the passage in Congress in October that year of the Iraq Liberation Act which made it official US policy to overthrow Saddam Hussein. It was always understood that the termination of the rule of Saddam’s Baathist Party would run the risk of fracturing the Iraq state into three component parts as Yinon’s paper suggested: A Sunni, a Shia and a Kurdish mini-state. Israeli politicians including serving prime ministers have at times openly petitioned US presidents to destroy Arab and Muslim countries perceived as threatening Israel’s security. For instance, in January 2003, when the invasion of Iraq was brewing, Ariel Sharon called on President George W. Bush to also “disarm Iran, Libya and Syria”. Also, Binyamin Netanyahu has since the 1990s been actively calling on the Americans to intervene in Iran, another state with a heterogenous mixture of cultures and religious sects, which is viewed as inherently vulnerable to efforts geared towards destabilisation and dismemberment. 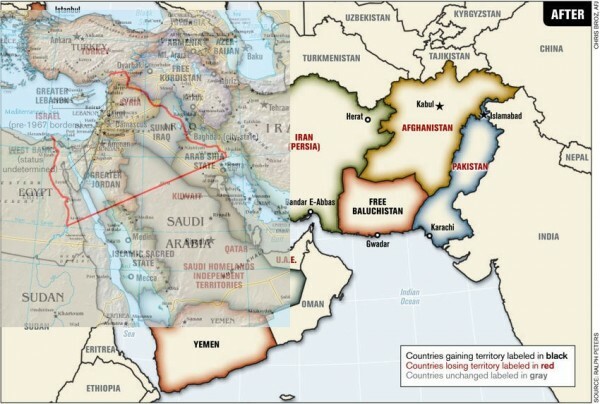 Iran formed a central part of the ‘Bernard Lewis Project’, a proposal contrived by the neoconservative academic in 1979, which argued the efficacy behind the West pursuing a policy aimed at dividing the countries of the Middle East along ethnic and religious lines. By encouraging groups such as the Kurds, Lebanese Maronites, Azerbaijani Turks and others to seek autonomous rule, Lewis envisaged an ‘Arc of Crisis’ which would spill over into the Soviet Union. Lewis’s project encompassed the breaking up of Turkey and Arab states such as Iraq and Syria since the creation of a Greater Kurdistan would necessitate this. The usefulness of Lewis’s worldview to the cause of Israel was explicitly acknowledged by Binyamin Netanyahu who, in eulogising Lewis when he died in May 2018, said that “we will be forever grateful for his robust defence of Israel.” Lewis, whose influence in the corridors of Washington has remained strong over the decades, supported the White House and Pentagon planners of the invasion of Iraq, a conflict which Netanyahu admitted in 2008 “benefited” Israel. Oded Yinon unsurprisingly singles Lewis out for praise in his interview. Lewis’s influence on US foreign policy was apparent in the doctrine of the ‘New Middle East’ unveiled by the then serving Secretary of State Condoleezza Rice in July 2006. The aim of securing change through the fomenting of violence and disorder hinted at the ‘Arc of Crisis’ rationale posited in 1979, with the neutralising of the ‘Shia Crescent’, consisting of Iran, Syria and Lebanon’s Hezbollah being the centre of focus. The ultimate objective of balkanisation was alluded to in a map prepared by Lieutenant-Colonel Ralph Peters, a retired US Army officer which was published in the Armed Forces Journal in June 2006. It depicted a redrawn Middle East map which included a Kurdish state, the creation of which is a present priority for the state of Israel. To the perpetual Israeli goals of weakening and destabilising Arab and Muslim states must be added the objective of acquiring more land for the state through territorial conquest, a notable example of which was the annexation of Syria’s Golan Heights in 1981 after it had been taken by the Israeli Defence Force during the war of 1967. The conflict of 1967 was a war of conquest prosecuted by right-wing ‘hawks’ who had seized control of prime minister Levi Eshkol’s cabinet with the aim of completing the task of acquiring land which had not been taken from the Arabs during the War of 1948. One of the most important aspects of this reach for ‘Greater Israel’, in which Israel conquered territory that tripled its size, was the desire to capture Jerusalem. The war of 1948, while often posited in Zionist historiography as a defensive war, had been waged to seize as much land as could be taken in excess of what had been provided under the vitiated United Nations Partition Plan. An important part of that campaign was Plan Dalet, which sought to expel Arabs from key areas so as to ensure a Jewish majority in all territories which would be controlled by the nascent Jewish state. We must immediately destroy Ramie and Lod. … We must organise Eliyahu’s brigade to direct it against Jenin in preparation for the Jordan Valley … Maklef needs to receive reinforcements and his role is the conquest of southern Lebanon, with the aid of bombing Tyre, Sidon and Beirut. … Yigal Allon must attack in Syria from the east and from the north. … We must establish a Christian state whose southern border will be the Litani (River). We will forge an alliance with it. When we break the strength of the (Arab) Legion and bomb Amman we will eliminate Trans-Jordan too, and then Syria falls. And if Egypt still dares to fight, we will bomb Port Said, Alexandria and Cairo. While Yinon claims in the interview that Israel does not require more territory, which he links solely to the capacity it has of protecting its existing borders, this is contradicted by the creeping colonisation of the West Bank, considered in Zionist belief to be that part of the ‘Land of Israel’ known as Judea and Samaria. Arab settlements continue to be constricted into small, increasingly non-contiguous entities that many have referred to as akin to apartheid-era ‘Bantustans’. The stringent blockade of Gaza and the intermittent war and military strikes on the territory appear designed to make living conditions so unbearable and hopeless as to convince Gazans to pack their bags and migrate. And if acquiring neighbouring land is not explicitly mentioned, the quest to create additional territory by stealth through the creation of security ‘buffer zones’ on its borders with Syria and Lebanon is real enough. But just how much more of the ‘Promised Land’ Israel would wish to acquire is an issue not openly discussed in contemporary times. Yinon smirked at the tendency of articles on his paper to reference a map of the Zionist ‘Land of Israel’ in its maximalist borders extending from the Nile Delta to the Euphrates River. Indeed, the claim that Israel continues to seek these borders is one which Zionists point to as a ‘conspiracy theory’. Belief in Israel’s maximalist borders, which have a biblical origin, was taken up by many in the modern Zionist movement. It was explicitly referred to in the emblem of the Irgun terror group. However, since the creation of Israel, most hardline Zionists have been content to publically refer to securing what they term the sovereign right of the Jewish people to what was the western part of the British Mandate of Palestine, with the Palestinian Arabs entitled to the land east of the River Jordan, that is, the modern state of Jordan. However, until Israel formally declares where it considers its final borders to be, fears that it wishes to acquire more land will legitimately persist. In the interview, Yinon claims that his plan has never really been implemented by any Israeli government, save for the adoption of some of his ideas by Israeli military intelligence (AMAN) during the present Syrian conflict. An obvious manifestation of this has been the medical and logistical support given by Israel’s military to jihadist militias fighting the Syrian Arab Army near the Golan Heights. It is clear that the largely jihadist insurgency in Syria which aimed to bring down the secular-nationalist government of Hafez al-Assad has been overseen by the United States as a means of aiding Israel’s geopolitical goals. The objective of American-sponsored balkanisation was clear from a US Defense Intelligence Agency (DIA) document which noted that a declaration of a Salafist principality in the eastern part of Syria would serve the interests of the internal and external opposition to the Assad government. With most of the jihadists defeated by the Syrian Arab Army in concert with Russia, Iran and Hezbollah, this goal has been continued by American and Israeli support for Kurdish militias in that part of Syria. The deliberate and calculated intervention in the affairs of the Arab world is something which Yinon is content to admit is unnecessary given the artificiality of the states which are the product of imperial draughtsmen. That was the criticism levelled at his paper by Yehoshafat Harkabi, a former head of Israeli military intelligence, who questioned the wisdom of working towards the dissolution of such countries if the initial analysis is that they will eventually fall apart. Moshe Sharett warned against Ben-Gurion and Dayan’s plan to “transform” Lebanon because of what he correctly claimed would be “an adventurous speculation upon the well-being and existence of others”. The corpses of the victims of attempts in recent times to reshape the Middle East testify for that. Yinon’s claim that an application of the spirit of his strategy has been limited only to the conflict in Syria is patently wrong. The neoconservative-inspired wars waged by the United States on behalf of the state of Israel in Iraq, Libya, as well as the ongoing plans to destroy the Shia Crescent by attacking Iran provide contrary evidence. The ‘Yinon Plan’ after all merely encapsulates Israeli policy of the past, the present and the future.